Our free online translator offers quick and accurate translations right at your fingertips. Simply type in the word or phrase that you want translated, and our Free Translation Tool will help you out. Do you have a bigger project? In that case, what you need is a human translation. Our team of professionals has the fastest turnaround time in the industry, and is 100% accurate. Get your FREE online translation quote, and we’ll respond in less than 10 minutes. Sorry! Our free translation service is currently down. 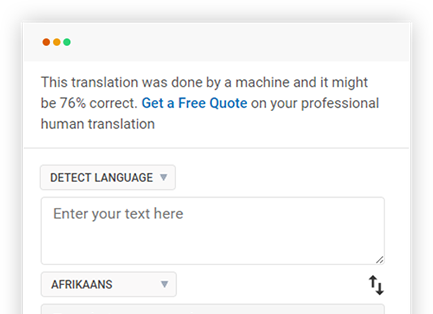 Please check again after some time or you can request an instant quote for a 100% human-powered translation. Human translation is more accurate and we’re here for you 24/7 to help you with all your language needs. Do you want access to free translation from your desktop? With our free Chrome Plugin Online Translator Extension, you can access translation services quick and easy. It’s like having your very own online translator built right into your computer. Fast, accurate, and guaranteed, that is our mission. Our free translation online translator and Chrome Plugin Online Translation Extension exemplifies this mission. You may be chatting with old friends from Berlin, or simply hoping to expand your language vocabulary, either way, it is the go to translation tool online. Try it out and let us know how much you love it! Yes, an online translator can save you if you need an immediate English to Spanish translation for your trip to Barcelona. But it will not be the tool to help you launch your new product line in Paris. For that, you’ll need a professional English to French translation from an industry-leading language service company. Wondering where else you need human-powered translations? Still not sure if this is what you need? Don’t hesitate to call our team or request your free translations quote. It’s our pleasure to help you make this decision. Remember, you can find an easy, free translation bot anywhere online. But we don’t want you to jeopardize income and resources with the heavy cost of mistranslation. You don’t need to play with fire at night. Get it done right, any time of day. We want YOU to have a special offer. No, thanks. I don’t want to grow my business.